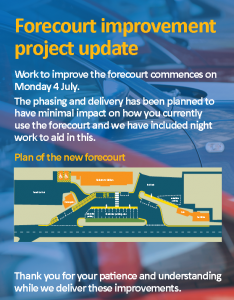 Forecourt Improvements commence on 4th July and will last until the end of August. This work is being done with minimal impact on business as usual. Decked Car Park Scheme starts on 18th July with enabling work and access improvements. This initial work impacts on 50 spaces. The main work then starts within 4 weeks and will last until the end of the year impacting on the whole car park. On the forecourt reconfiguration, there was resident concern (read Haslemere Herald here) about some of the plans which I wrote about briefly yesterday. These are being reviewed by SWT. Keep checking for more updates. 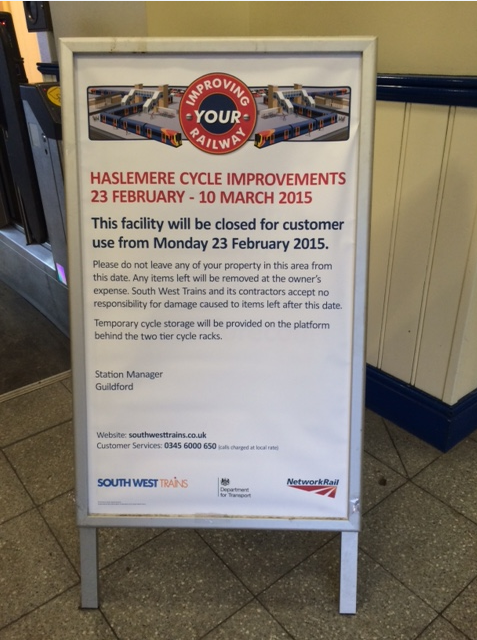 Preliminary work was due to begin 3 days ago, however, it is delayed whilst SWT aims to accommodate resident feedback. A design of the forecourt will be published here once it is finalised. Click here to view a line drawing of the decked car park. This entry was posted in Haslemere first and tagged Decked Car Park, Haslemere, South West Trains, Station Forecourt, Surrey County Council on June 23, 2016 by admin. 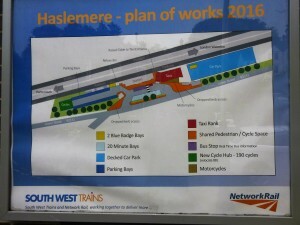 Haslemere railway station forecourt plans are being amended by South West Trains in the light of recent community engagement events. 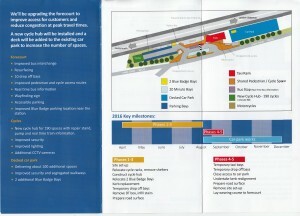 The project start date and all station forecourt and car park plans will be put on this website as soon as they are available. This entry was posted in Haslemere first and tagged Haslemere, Railway Station, South West Trains, Surrey County Council on June 22, 2016 by admin. South West Trains and Surrey County Council want to make it as easy as possible for people to access the station. We want to understand what travel options you would be interested in and willing to try during the works. If you have a minute, please click on the survey link below and answer the questions. We need as many people as possible to respond to help us gauge demand for a Hoppa service during the works. In addition, are you aware of these websites to help you plan your route and also to find alternative parking during the works? Website: https://www.travelsmartsurrey.info/ with information for journey planning including calorie information and cost breakdown for each journey choice. The website links drivers and passengers so they can share their journeys. You can join the network free of charge. You’ll save money as soon as you start lift sharing. 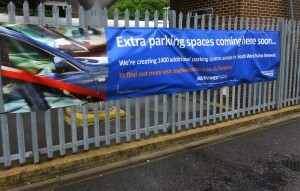 When the work begins on the decked car park, there will be more cycle parking at the station, as part of a wider cycle scheme delivering an additional 1400 cycle spaces across the South West Trains network. This entry was posted in Haslemere first and tagged Cycle Hub, Haslemere, Hoppa, Railway Station, South West Trains, Surrey County Counicl, Surrey Lift Share, Surrey Travel Smart on June 20, 2016 by admin. 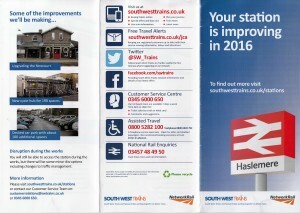 Earlier this week, I gave details about Haslemere Railway Station: Works Disruption Information Events, 14th June 2016. When the car park works begin at Haslemere railway station, it’s recommended that rail users look for alternative arrangements to get to and from the station where possible, using local bus services, walking, cycling or getting lifts/sharing taxis. We are exploring other options available, one of which could be to introduce a shuttle minibus from/to the busiest areas. In order to understand if this is something SWT customers would be willing to use, please could you print and complete this shuttle bus feedback form and hand it to Haslemere ticket office by 24 June. This entry was posted in Haslemere first and tagged Alternative Transport, Decked Car Park Works, Haslemere, Shuttle Bus, South West Trains, Surrey County Council, Survey on June 3, 2016 by admin. 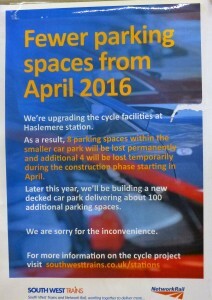 Major improvement works have started at Haslemere railway station, to provide more bike parking, improve bus, pedestrian and cycle access and provide more car parking at the station. There will be major disruption for travellers during the works. For those that pick up and drop off during the station forecourt works (June and July) and for those that park at the station – the main station car park will be COMPLETELY CLOSED from September for several months. Come and find out more at a second event on 14th June! 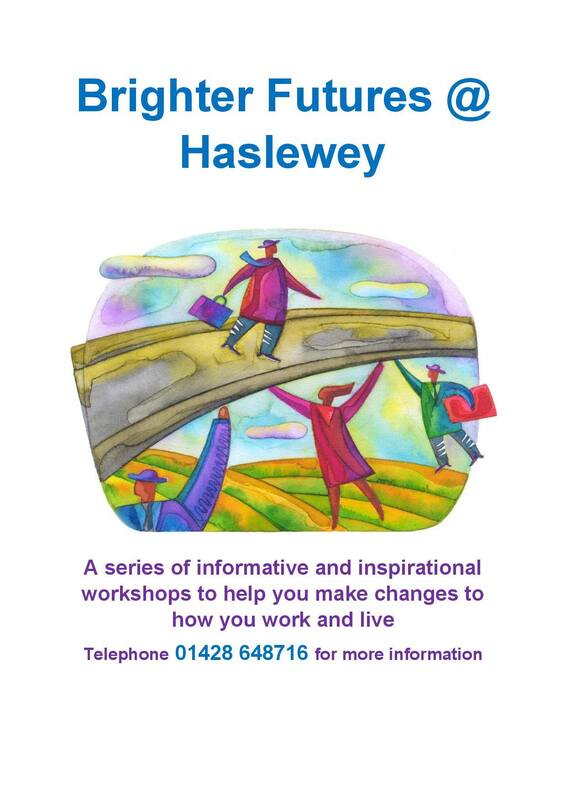 South West Trains, in partnership with Surrey County Council and the Haslemere Community Rail Partnership, will also be holding an information event open to all, residents and train users at the Georgian House Hotel, Tuesday June 14th, 7.30-9pm. There will be considerable disruption for travellers during the railway station works. Access to the station forecourt will be restricted at times during the improvement works and the main station car park will be completely closed for 3-4 months. Surrey County Council, in partnership with Haslemere Vision and SWT, has been working to identify and communicate possible alternative ways of getting to the station for those that currently drive. 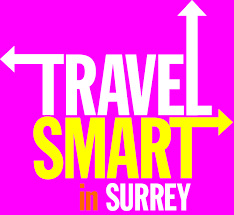 Would you be willing to spend 1 hour being trained by Surrey County Council’s Travel Smart team? You could be part of a team of local volunteers helping to advise train passengers about the different travel options to the station during the car park closure. To show your interest, please contact the Surrey Travel Smart team travelsmart@surreycc.gov.uk. This entry was posted in Haslemere first and tagged Decked Parking, Haslemere, Haslemere Railway Station, South West Trains, Surrey County Council on June 1, 2016 by admin. 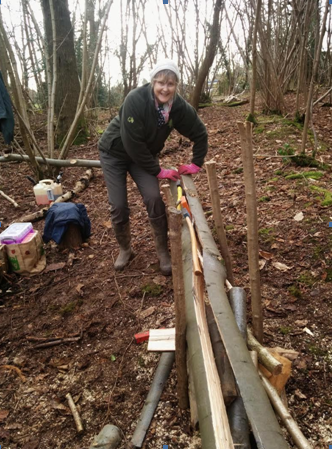 Please see my latest update of activities in the community since the New Year. Attended Haslemere Town Council (HTC) meeting (15th January) where a large number of representatives from user groups of the Youth Campus in Wey Hill, including many brownies and scouts, staged a demonstration asking for HTC’s support to remain at the site and to be given a long lease so that they can invest in improvements. Local scout leader Paul Buckler then gave a short presentation outlining their plans. This is the open letter and annexe that were sent to Waverley Borough Councillors by the youth campus stakeholders. Very positive meeting with SWT and SCC passenger transport (19th January) the long-term outcome of which will hopefully work towards a more integrated transport strategy. Issues discussed included SWT/SCC plans for Haslemere train station forecourt reconfiguration to prioritise buses, pedestrian and cycle access- I raised my concerns that the planned changes must be integrated with associated highways improvements on Lower Street, that adequate public information must be given before the works are carried out as they will impact on the current parking in the station forecourt and that although a positive step to promote buses, the current SCC passenger transport review may in fact modify local bus services. It was agreed that a station travel plan is needed in order to develop a more holistic transport strategy going forward. SCC is currently working in partnership with SWT to draw up a package of travel plans for a number of Surrey train stations – I have requested that Haslemere is prioritised. The request that Haslemere Visitor Information Centre should have a greater presence at the station was positively received by SWT – I am currently following up on this. The general need for improved signage at the station, including real time bus information, was discussed and should be introduced as part of the forecourt reconfiguration. 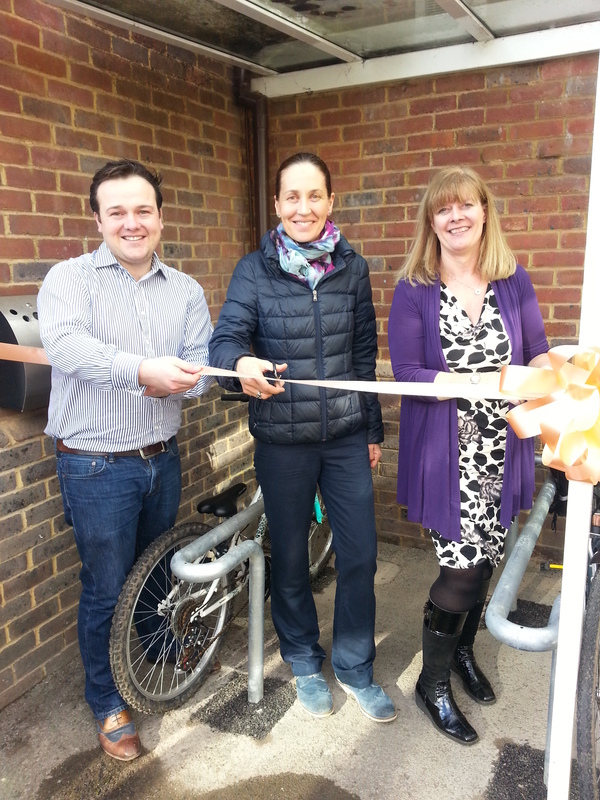 A bid has been made for funding for a ‘Cycle hub’ for 100 bikes at the station – news on this later in March. 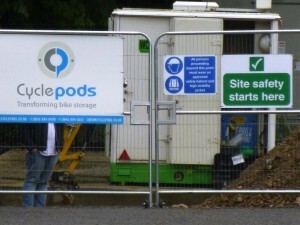 SWT: an additional 18 cycle parking spaces at the station are currently being installed. Attended Haslemere Conservation Area Review meeting (on 29th January) at Haslemere Town Council. See here for more information about Haslemere’s town centre conservation area. 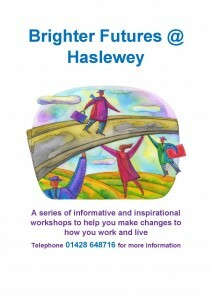 Attended Haslemere Vision housing workshop (31st January). Once written up, the minutes will be here. Attended Undershaw planning meeting (4th February) and gave strong support for the planning application on education grounds (my letter to The Herald is here). Very pleased it was approved by Waverley Southern Planning Committee, the final decision is currently with the Secretary of State. Grayswood to discuss improving safety for pupils in response to school expansion. Agreed to fund dropped kerb outside the school and gateway signage into village. Local residents, the school, and the Village Traffic Liaison Group requested an extension of double solid centre white lines further north on the A286 to improve pedestrian safety. I supported this request, and asked SCC highways and the police to consider this. The request has been rejected on technical grounds. Woolmer Hill School to discuss pupil road safety with SCC schools road safety officer, agreed that best option is manned crossing patrol. Shottermill Infant School to discuss pupil safety. I have also requested that SCC highways respond to residents’ pedestrian safety concerns at the Sturt Road- Sun Brow/Kings Road junctions and along Scotland Lane. Lining outside St Bartholomew’s School have been reinstated following resurfacing. Other lining agreements from the Parking Review 2014 will be carried out soon. The lining team is running behind because of the volume of lining in Farnham. Have requested Haslemere is first on the list in the next parking review. Lloyds Bank car park – access to the car park has been blocked causing knock-on effects to parking up College Hill and in Hill Road. The landowner has now installed a railing, blocking pedestrian access down the side of the car park into the High Street. I have been in touch with the Surrey Legal Team regarding the possibility of formally designating this a right of way based on history of use. Have also arranged to meet Waverley’s Fire Safety Officer to assess access. Met Vicarage Lane residents about potholes. The road has been included in Project Horizon (Surrey-wide highways improvement program) and is due for repair soon. Residents of Sunbrow/Sickle Road continue to face highways issues linked to the the narrow width of the highway and the erosion of the bank below the WBC recreation area. Installation of width restriction sign on Woolmer Hill. Continuing to attend social service/education review meetings for a family with adopted children who are not currently getting the help they need. To continue to put Haslemere First, always looking to improve the way local councillors work together. Made request to Haslemere Town Council suggesting ways of working more cooperatively and collaboratively by increasing councillor use of social media, joint councillor surgeries and posting recordings of meetings. I have used these funds to provide a new grit bin for Scotlands Close, bike racks at Haslewey and to fund a week of a SCC vegetation gang. Attended E & T Select Committee meeting (agenda here) (on 22nd January). Raised a question concerning the large number of highways projects where matched funding is required, concerned that this will negatively impact on Local Area Committee funding; however, Cabinet Member John Furey assured me it would not. Met Cabinet Member for Transport and Surrey Communications Strategy team (22nd January) to discuss what lessons could be learned from the recent A286 example of poor communication. Very useful, resulted in the planned development of a county wide protocol including the use of social media, local radio and the Member for Transport. Used social media (Facebook and Twitter) to share daily updates for the A286 roadworks and thanks to everyone who shared the information. Organised a meeting (26th January) with Living Streets, representatives from Haslemere Vision and SCC Highways Sustainability team. We discussed the options for a street audit to help create safe, attractive and enjoyable streets in the town. I’ll write a separate update about this in the coming weeks. Meetings of Waverley Youth Task Group (9th & 11th February) awarding contracts for Youth Local Prevention Framework (1 to 1, and community outreach contracts). The priority of the framework is to build the resilience of young people and to remove identified barriers to their future employability as part of Surrey’s early help arrangements. For more information on youth services on offer in Waverley: www.new.surreycc.gov.uk- search: “young surrey”. Last Minutes from LAC meeting here. Next meeting will be on 20th March in Haslemere Hall and you can view the agenda here once it is ready. Please note the Waverley Local Area Committee is on Twitter, @WaverleyLC. Surrey PCC Kevin Hurley commissioned YouGov plc to carry out independent research of Surrey people over a series of months to understand public sentiment towards the referendum. The questions asked and the corresponding results are here. “Are you looking after someone but juggling too much? The council is launching a fortnight long campaign, on Monday 2nd March to signpost people whose lives are squeezed by caring duties to information and support. It will also encourage them to talk to their GP about their caring role. Across Surrey there are people who spend much of their time juggling a career and running their home, while carrying out caring duties. Often referred to as “sandwich carers”, they will be providing unpaid care, mainly for an older or frail parent or relative, while also helping care for other family members, such as grandchildren. Such a caring commitment can put people under considerable stress, affecting their health and wellbeing.” Also see Hidden Carers here. The Care Act is the biggest change to English adult social care law in over 60 years. Surrey County Council has a page here intended to help you understand the Act and how the council is responding in Surrey. This entry was posted in Councillor Barton Update and tagged Brownies, Councillor Barton Update, Cycle Improvements, Haslemere, Haslemere Conservation Area, Haslemere Vision, Haslemere Youth Campus, Highways, Independent, Living Streets, Nikki Barton, Parking, Scouts, South West Trains, Stepping Stones, Surrey County Council, Undershaw on February 28, 2015 by admin.